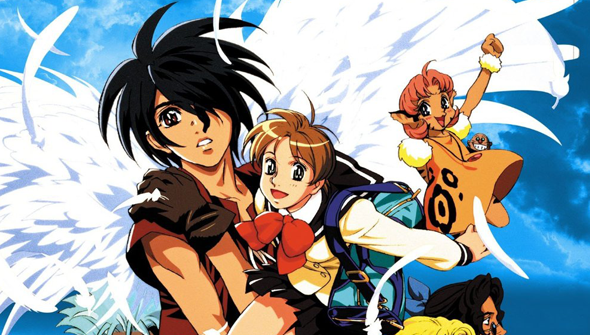 The Vision of Escaflowne is one of the most beloved anime of the 1990s. However, thanks to it's original US distributor Bandai USA going out of business, it has been out-of-print in English for some time. It was among the Bandai titles that were license rescued by Funimation a while back, so fans have been waiting to hear what the release plans would be. Few people would have been expecting this though: Funimation have announced their first ever crowdfunding campaign in order to bring a collector's edition Blu-ray to the US market. The issue is that a director's cut of the series has been released in Japan that was never released in English. This means that the original dub no longer fits with the new version, which means that they either need to record a whole new dubtrack or release the director's cut as subtitled only. Funimation say that the Kickstarter is to see if there is sufficient demand for a director's cut dub or not. The decision to go this route has been attracting controversy in some quarters. The argument goes that Funimation is a big enough company to take the risk (as they do with every other release, to be fair) and that Escaflowne is a popular enough franchise that this is unnecessary. The counter-argument to people who object to crowdfunding is always pretty simple: if people don't want it, they won't pay for it. However, in this case, some have expressed concern that this could set a precedent for future releases from the company. The campaign has already nearly met its goal of $150,000 at the time of writing- despite having only launched at the weekend. Bear in mind that it's a pricier prospect than a normal Funi release, as the full set will cost a whopping $125. The less flush can plump for the part one only, but $65 for a half-season is also asking a lot. Mind you, that's chump-change in comparison to the Five Grand one fan has already paid out to visit Funimation's studios and appear in the dub. The campaign runs until March 31st. Visit the campaign page for more. Meanwhile, another campaign has launched that will be of more interest to fans of manga. Samurai Lone Wolf is a new version of the classic Japanese Samurai graphic novel series better known in English as Lone Wolf and Club. Hifumi Kono, creator of the Clock Tower video game series wants to bring the series (created by the legendary Kazuo Koike, and illustrated by the late Goseki Kojima) to life as a 'motion comic'. For the uninitiated 'motion comics' are created by taking original comics and adding motion, limited animation and sound to create an experience that is somewhere between reading a comic and watching an animated film. The goal is to create a motion comic collection of stories from the manga's first five volumes, spanning around 300 pages. It will be available as a digital download or on a Blu-ray disc. The campaign will run until March 26th. Visit the campaign page for more info.